The group of 17 islands, set amid the breathtaking, rugged beauty of Scotland’s north west coast, were home to more than 100 people a little over a century ago. 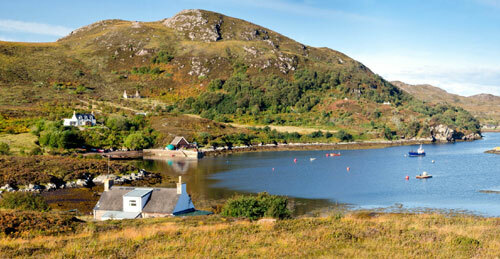 The young family that lived on, and owned Tanera Mor, were the last to call the Summer Isles their permanent home. Lizzie Williams married her husband, Richard, on Tanera Mor are trying to sell the island and its holiday cottage business and have already cut the price by £500,000. As well as losing its permanent population, the island boasted one of the few private postal services in the UK, which could also be under threat. The fictional west coast Scottish island of Summerisle was the setting for the 1973 film The Wicker Man. The cult film followed a sergeant investigating the report of a missing child and who comes across the island’s strange pagan rituals. The Summer Isles were first occupied by the Vikings and, at the end of the 19th Century, were home to 120 residents and a thriving herring industry. 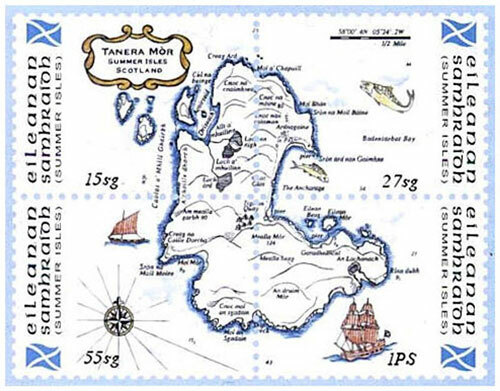 Tanera Mor – at 1.2 miles wide and 1.6 miles long – is the biggest of the islands and still attracts around 5,000 visitors a year. But the number of residents began to plummet after the First World War and great depression. The Williams lived there with a baby and toddler. Tanera Mor is accessed by boat from the village of Achiltibuie in Wester Ross. It has been on the market since May 2013 and the price was reduced this year from £2.5 m to offers over £1,950,000. The price includes its very own approved postal service and licence to design and issue private Summer Isles postage stamps, much sought after by collectors. This was the first year since her parents bought the island no new stamps were designed Mrs Williams explained. “For 15 or more years we have done an issue every year,” she said. The unique traditions and histories of the Summer Isles inspired the cult pagan film The Wicker Man. Priest Island, the outermost and most exposed of the Summer Isles, is reported to have been home to an early christian retreat with mysterious stone circles. While Isle Martin, the closest of the islands to Ullapool, is named after St. Martin, who is said to have established a monastery there at about 300 AD. The island was once home to workers from a flour mill that operated in the 1940 but has been uninhabited for many years. Depopulation has been an ongoing issue for the Highlands and Islands of Scotland for decades. The Western Isles, 40 miles across the Minch from the Summer Isles, has the largest Scottish island population but struggles with falls in the number of people living there. Between 1998-2008, according to the General Register Office for Scotland, the population declined by almost 5%. What a wonderful beautiful island. it would be wonderful if it could be bought by witches from Scotland, England and Europe.